Esther E. McGee, age 97, formerly of South Milwaukee Street, Fredonia died Tuesday, October 8, 2013 at Samaritan Health Center of West Bend where she had resided the past few years. 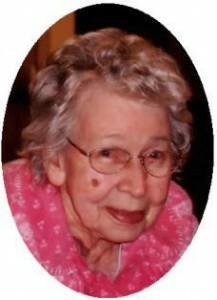 She was born on April 12, 1916, daughter of John and Winifred Olson Atchison in Crosby, ND. On August 14, 1933, Esther married Merle G. McGee of Turtle Lake, WI in Winona, MN. They lived in Alma, WI until 1955 and later moved to Richfield for three years. Together they called Fredonia home, she for over 50 years. Merle preceded her in death on June 13, 1968. For over 33 years, Esther was a machine operator at Tecumseh/Power Products in Grafton. She retired in 1978. She had traveled extensively throughout Norway, Denmark and Sweden, taking in the sights and their family heritage. Before Alaska was a state, she and her husband drove the rustic roads of the day. She covered most of the continental United States while keeping a ledger of her travels, as well as, her daily life. She was a lifetime member of the Ladies Auxiliary Flag Day Memorial VFW Post 7037 and St. John�s Lutheran Church of Fredonia. Esther enjoyed crocheting and reading. She is survived by her children Lois “Dolly” (the late Odin “Bud”) Pederson of West Bend, Maxine (Ray) Schwinn of Port Washington, Roger (Diane) McGee of Wauwatosa and Judy (Roger) Harms of Eleva, 14 grandchildren Jeanne (Jerry) Lorenz, Pam (Gary) Bares, Bob, Jeff (Arlene), Jody, Penny, Scott McGee, Debbie Lucero, Craig (Julie) and Todd Thelen, Wendy (Chuck) Algiers, Kelly (Michael) Matchey, Ann (William) Gentil and Brian Harms; 36 great-grandchildren, 17 great-great grandchildren; other relatives and friends. Esther is preceded in death by her husband Merle, daughter Sharon, sons Kenneth and Gary McGee, three brothers Vae “Del” and Douglas “Buck” Atchison and Clifford Borgwardt, grandson James McGee and son-in-law Odin “Bud” Pederson. Funeral Services 11AM Monday October 14, 2013 at St. John Lutheran Church, 824 Fredonia Avenue, Fredonia. Reverend Robert Zick will be the officiant. Visitation 3-5PM Sunday, October 13 at the POOLE FUNERAL HOME, 203 N. Wisconsin Street, Port Washington and after 10AM Monday AT CHURCH. Interment St. Rose of Lima Catholic Cemetery in Fredonia. Memorials to St. John Church, Fredonia or Waubeka Memorial VFW Post 7037 appreciated.